Draft Craft is one of the places where it’s hard to find the good in it – it’s expensive, tax is not included, has smoking throughout, has loud music – but at least there is no table charge and there is a semi-decent range of beer on tap. However, those last two points can’t save Draft Craft from a scathing review and ultimately I won’t be going back there again. It’s bars like Draft Craft that turn people away from drinking craft beer, thinking it’s too expensive and it’s places like this that should not be given your money. Leave it well alone. Futakotamagawa is a peculiar place in that it’s a major commuter hub for people coming into Tokyo via the south west, yet with so much urban development, the number of craft beer bars was zero for such a long time. With Draft Craft, located less than five minutes from the station, opening in October 2013, Futakotamagawa had its first craft beer, with others soon following suit. Draft Craft is styled on an American diner and grill, though from looking at previous pictures, it’s gone through a couple of renovations before the current design. It has space for about 40 people inside though it is fully smoking, so expect that if you do go. There isn’t any outside area either to escape from the smoke, and while there is ventilation, it didn’t seem to be doing a good job on the day. Thankfully there isn’t any table charge for the place but there isn’t any WiFi either. …these are the real prices. And about another 900yen for this. There are 15 taps at Draft Craft, though most peculiarly, the menu lists beers that have sold out or not available, making things slightly annoying when trying to order. What’s the point in having a beer on the menu, but telling me it’s sold out?! Beers come in two sizes: small (250ml) from ¥690 to ¥990 and large (470ml) from ¥1140 to ¥1800 – perhaps the most expensive we’ve come across in Japan. And these prices don’t even include tax either. There is also no happy hour nor a beer tasting set. Two beers in and I had already spent ¥2000. Excuses were made and bills were paid. 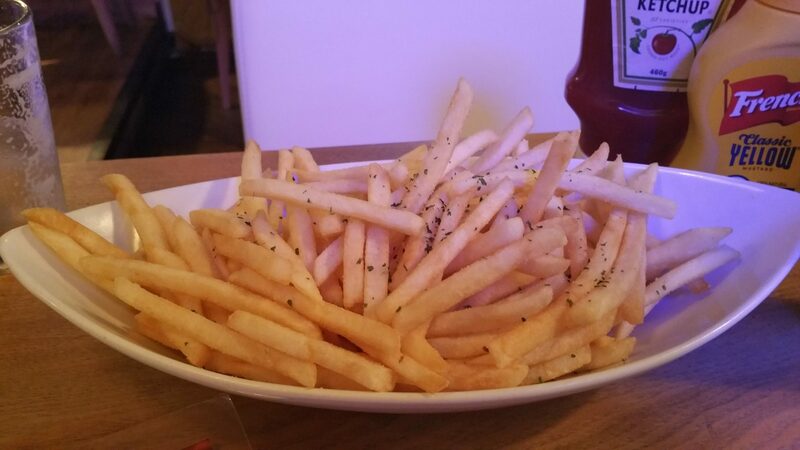 The only redeeming thing about the bar is the large chips but be warned – they are heavily salted. The food at Draft Craft is supposedly based on an American grilled food but after ordering a beer at that price, the food didn’t look too appetising and neither did the prices. One plate of chips was ordered and while large, they tasted like someone had dumped a truck load of salt on them – I guess trying to encourage people to drink more and pay more. The closest station to Draft Craft is Futakotamagawa station on the Tōkyū Den-en-toshi Line (DT-07) and Tōkyū Ōimachi Line (OM-15). Turn left out of the main barriers and walk through the Takashimaya department store. Draft Craft is located just outside the entrance. I went there once and all of the good beers on the menu were not available. Also, it was lunch time so filled with salary men chain-smoking their way through the cigs they’d missed on on that morning and would that afternoon when they went back to the office. Sorry to hear you had to put up with that. It’s a pain in the backside to have to deal with smokers and the smoke spreading out, especially for people that don’t like it. Both times I’ve been here it’s been smokey and not enjoyed it. A place definitely to avoid, if not for the smoke, then the prices.